Stal Hendrix’s team was well on track this weekend at the CSI2* New Year Tour in De Peelbergen. Oda Charlotte Lyngvaer kicked off 2019 with another win aboard Goanita HX, and Timothy Hendrix was victorious in the 1.35m final riding Gogolinus. At the first international competition of 2019 Oda Charlotte claimed another win with the Zandor Z-mare Goanita HX, who’s bred by Stal Hendrix. After 14 (!) International victories in 2018, it was the same again for this pair at CSI2* De Peelbergen this weekend. 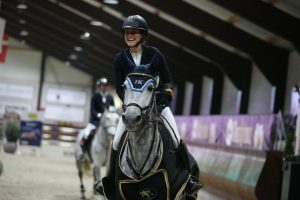 They won the 1.30m speed class, and finished second in the 1*-Grand Prix on Sunday. They were only 3/100 of a second slower than the winner. On Friday they were already able to finish fifth in the 1.30m class. Oda also achieved good results with the Namelus R-son Hurby, like the second spot in the 7yo-class on Saturday. Just like his partner, Timothy Hendrix likes to win too. He proved that on Sunday in the 1.35m-final, beating all the competitors aboard the Sheraton offspring Gogolinus. They had already been placed two times this week in Kronenberg. In the 1.35m speed class they finished third, just behind Sophie Hinners and Giolita (s.Zirocco Blue VDL). With her GP-mount Vittorio 8 (s.Valentino DDH) Sophie performed well on Sunday. With only one time penalty they ended up on the 10th place in the 1.45m Grand Prix. Thanks to a double clear round, Michel Hendrix was among the prize winners in the 1.45m ranking class on Friday riding the stallion Don Diablo HX (s. Vittorio). In the 1.40m-final he took the seventh prize after a double clear result with the well-jumping Zirocco Blue VDL-son Fair Field.